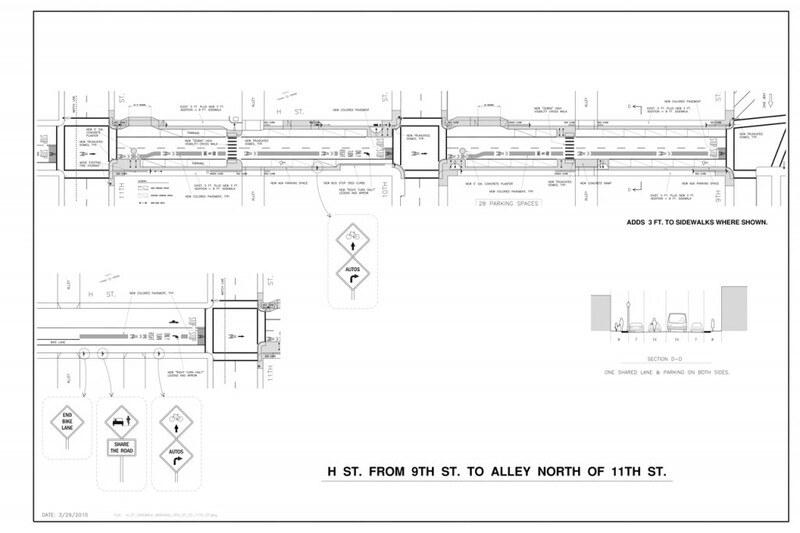 H Street plans courtesy City of Arcata Public Works. H STREET – The first week of September will see the beginning of a revolution on two blocks of downtown H Street, but major change will come only after a fairly violent six-week battle. The two blocks affected are between Ninth and 11th streets. Each block will be torn up one at a time and in two three week intervals, re-done from below-the-ground up by Public Works. The 900 block, ranging from the Garden Gate to Sassafras, will be done first. The 1000 block, from the Minor Theatre to Funk Shui, will complete the project. The City recently held an Open House to explain the project to concerned business owners and residents and hear their concerns. Another is to be held prior to construction. While H Street will get its share of newfangled traffic calming and pedestrian improvements, this road reconstruction project won’t just be cosmetic. Public Works is eager to get at the creaky old water and sewer lines buried deep in the ground. Excavating and replacing them will take a massive road rip-up effort requiring traffic to be detoured to I Street. Somehow, though, pedestrian traffic to H Street shops will be maintained. The end result, after six weeks of noise and disruption, will be an up-to-date street with a dedicated traffic lane, a multi-use bike and loading lane, sidewalks widened to eight feet from the present five, new light standards, removable concrete planters, plus an additional parking space. In addition, drainage improvements will be installed, complete with special drain inlet boxes to trap cigarette butts which would otherwise find their way into the bay and ocean. The City decided to do all the road and sidewalk improvements at once rather than a lane at a time in order to shorten the disruption period. Keeping one lane open would have lengthened and complicated the project, said Public Works Director Doby Class. “We’ve had hours and hours of discussion on this,” he said. While the timing may seem inopportune, coinciding with resumption of classes for Humboldt State’s fall semester, the project was set for the driest time of the year. Rainfall would only complicate and lengthen the project, Class said. Merchants in attendance at last week’s meeting were concerned that students wouldn’t find their businesses, or would think that they are closed. Someone suggested that the City’s electronic message sign be placed farther up H Street to notify those headed downtown that the stores and businesses are open. Arcata Main Street Director Jennifer Koopman said she will work with merchants to ameliorate impacts. Class said that to help make sure the work comes off on schedule, the contractor will be fined $2,000 per extra day of work beyond that scheduled. A possible bonus for finishing early will be discussed at a pre-bid meeting. The project has been advertised and bids are being received, with bid opening set for Aug. 17. That’s the same day of the next City Council meeting at which the bid will be awarded. The council might also modify existing rules regarding hours of construction from the nominal 8 a.m. to 5 p.m. to 7 a.m. to 6 p.m. It could also allow work to take place on Sundays, a day merchants said gets little foot traffic. ‘For more information, please contact the City’s Public Works Department at (707) 822-5957. This entry was posted on Tuesday, August 16th, 2011 at 2:02 pm	and is filed under News, Community, Business. You can follow any responses to this entry through the RSS 2.0 feed.